Shiny Mega Venusaur in game: 23 Who? Important notice! 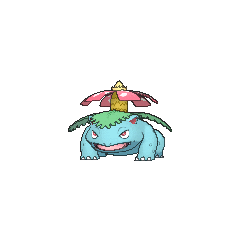 Pokemon Shiny Mega Venusaur is a fictional character of humans. Venusaur (Japanese: ????? 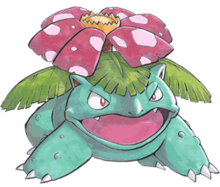 Fushigibana) is a dual-type Grass/Poison Pokémon introduced in Generation I.
Venusaur uses its flower to catch the sun's rays to convert them into energy, which causes the flower to take on colors that are more vibrant. The flower releases a soothing scent that attracts Pokémon. This scent becomes stronger after a rainy day. 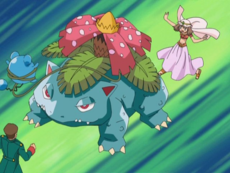 In the anime, Venusaur has demonstrated the ability to manipulate nature and lead evolution ceremonies for Bulbasaur and Ivysaur. Frenzy Plant was its signature move in the past. This Pokémon is rarely found in the wild, but has been known to inhabit grasslands. Spenser's Venusaur debuted in Cutting the Ties that Bind. Spenser had Venusaur use Sweet Scent to drive away the furious Beedrill. 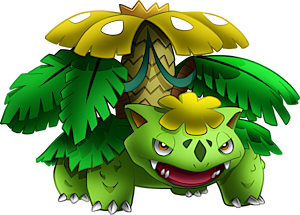 Venusaur was the second Pokémon that the Palace Maven used in his battle with Ash in Ka Boom with a View!. The Seed Pokémon won against Ash's Heracross, but lost to his Swellow. It made another appearance in a flashback in King and Queen for a Day!. 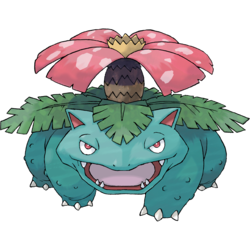 In Pruning a Passel of Pals!, May's Bulbasaur was revealed to have evolved all the way into a Venusaur during her absence from the series. She was briefly seen facing off against a Coordinator's Marill in the Battle Stage of the Wallace Cup. A Venusaur leading an evolution ceremony for Bulbasaur appeared in Bulbasaur's Mysterious Garden. A Venusaur nicknamed Bruteroot was under the ownership of a Trainer named Corey in Mewtwo Strikes Back. Like Corey's other Pokémon, it was cloned by Mewtwo. Its clone made another appearance in Mewtwo Returns. Drake of the Orange Archipelago used a Venusaur in his battle against Ash and his Tauros in Enter The Dragonite. An artist has a Venusaur as a long-time friend, which he used to battle Team Rocket in The Light Fantastic. When Team Rocket was working at the Battle Park in One Trick Phony!, James used a Venusaur in a battle against Ash's Cyndaquil as part of an elaborate plan to capture Ash's Pikachu. A Trainer's Venusaur that can Mega Evolve into Mega Venusaur appeared in Mega Evolution Special IV. A Venusaur appeared in a fantasy in A Rush of Ninja Wisdom! under the ownership of Nihei. It made its first physical appearance in The Legend of the Ninja Hero!. In The Ghost of Maiden's Peak, a Gastly created an illusion of Venusaur in order to frighten Ash's Bulbasaur. 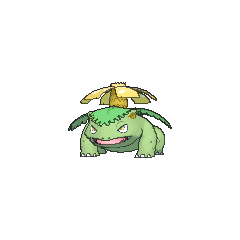 Gastly subsequently combined this Venusaur with an illusionary Blastoise to create a Venustoise, which terrified both Squirtle and Bulbasaur out of battling. The first time a real Venusaur made an appearance was a cameo in March of the Exeggutor Squad. Venusaur also appeared in The Power of One, May, We Harley Drew'd Ya! and Zoroark: Master of Illusions. 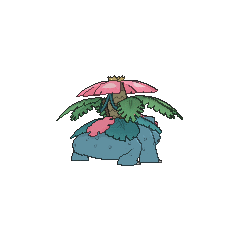 A Venusaur was one of the Pokémon seen in a field of flowers in Houndoom's Special Delivery. It tried to use Sleep Powder on Misty's Togepi, but Houndoom blocked the attack, causing itself to fall asleep. A Venusaur was seen in a Pokémon Center in Moving Pictures. Two Venusaur appeared in the intro of the second Advanced Generation series movie, Destiny Deoxys. 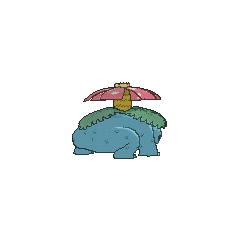 As seen in Numero Uno Articuno, one of the Pokémon Noland offers for challengers to battle is a Venusaur. However, Ash instead chose to battle Articuno. A Venusaur appeared in Alexa's magazine in The Journalist from Another Region!. A Venusaur that can Mega Evolve into Mega Venusaur appeared in Mega Evolution Special I. 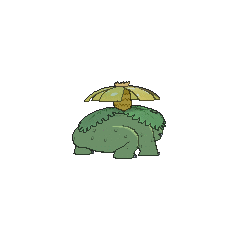 A Venusaur appeared in SM003, as a silhouette. Red has a Venusaur nicknamed Saur which he received it as a Bulbasaur from Professor Oak in Bulbasaur, Come Home! after witnessing the bond shared between the two while battling a wild Machoke, learning SolarBeam in the process. Bulbasaur evolved into Ivysaur in Wartortle Wars after defeating a wild Primeape, and into Venusaur in The Winged Legends while fighting against the merged version of Zapdos, Moltres, and Articuno along Blue's Charizard and Blasty, defeating it with its augmented SolarBeam while the others used Flamethrower and Hydro Pump, respectively. With the unusual help of Poli and Pika he was able to defeat Blue's Charizard at the Pokémon League, winning the battle and the tournament. At Two Island, Saur learned Frenzy Plant from Ultima, and was able to destroy Mewtwo's restrictive M2 Bind, again with the help of the other two starters. During this incident, it was temporarily traded to Blue, but was given back to its owner soon afterward. 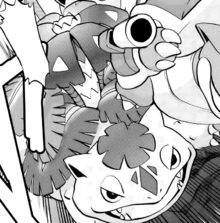 Shigeru owns a Venusaur in the Pokémon Zensho manga series. When Venusaur is released from a Poké Ball, it uses the move Frustration to cause an earthquake, similar to Donkey Kong's Down + B attack. Any player caught in this will be sent flying. However, in Pokémon FireRed and LeafGreen, after the player has unlocked the National Pokédex, Cooltrainer Albert uses a Venusaur on Knockout Mode at the Trainer Tower. Venusaur appears to be based primarily on some form of reptile, specifically the tuatara or any of the mammal-like reptiles known as Dicynodonts from the Permian period or the Kannemeyeria from the Triassic period. 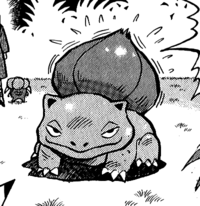 Other than a lack of a tail, and with visible ears and no genuine metamorphosis stage (evolution aside), Venusaur does not have much in common with amphibians such as frogs and toads (which metamorphose from one definite creature into another as they mature as opposed to just growing into a larger adult version of itself the way that Venusaur does); instead, it more closely resembles reptiles such as lizards and tuataras. Alternatively, Venusaur's large rounded snout, wide mouth, wide-set eyes, bumpy wart-like skin, and quadraped-like movements are vaguely similar to those of certain amphibians, such as the common toad. 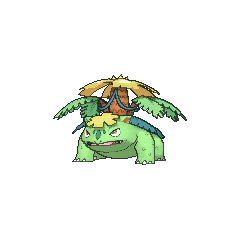 Unlike Bulbasaur, Venusaur's "ears" do have hollows indicating that they are in fact ears and not glands, as seen in many species of frogs and toads. Fushigibana is a pun on ????? "fushigi na hana" (strange flower). Cantonese Chinese ??? Geiyihfa Literally "Unusual flower"
Mandarin Chinese ??? Miàowahua Literally "Wonderful frog flower"